How Do You Choose a Type of Landing Page? What Type of Landing Page Should I Use? Home/Content Development, Online Marketing, SEO/What Type of Landing Page Should I Use? If a landing page is any page a visitor lands on, what’s a preferred landing page? Simply, PLPs are pages you would really like visitors to land on, more so than other pages on your site. In Landing Page ROI 101: Are Your Landing Pages More Like Bouncing Betties?, we spent a lot of Internet blogging real estate discussing the possibilities of action if your PLPs were flopping. What if you’re just starting out, though? What do you have to look forward to in the simple creation of preferred landing pages? How do you know what type of landing page to use? Why a Preferred Landing Page? The purpose of a landing page is to entice a visitor to perform a specific action. When that action is completed, it’s known as a conversion. This action could be as simple as giving their name and email address or as complicated as buying a product. The marketing campaign’s goals decide the type of landing page you use, and the PLP decides how the conversion happens. What Landing Page Do I Use? Conceivably, you could just pretty up the pages on your site, throw in some optimization and call it done. You could, but then your content probably won’t get the attention or results it deserves. No matter how good your pages are, using the right type of landing page with your marketing campaign will increase your response. What does this landing page offer? Landing pages offer one of two things: a product (Sham Wow) or information (Receive a free ADT quote). Sometimes these two are intertwined throughout the page (buy now and get this free eBook on building your business), but the main offer remains the same. If you’re offering multiple products, you might rethink how you’ve set up your page. Landing pages of any type should be dedicated – focused on a specific product, service, bit of information. What is the goal of this landing page? 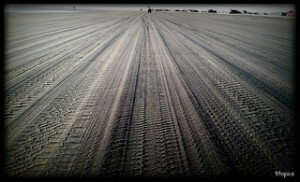 Now we can talk about driving traffic to the site. We can even talk about gaining 500 emails. Here is where you pinpoint your specific goal for the page, whatever it is. Just make sure it’s specific. Click Through Landing Page – This very simple PLP is created with the equally simple goal of moving people to the sign up or purchase step without distractions. 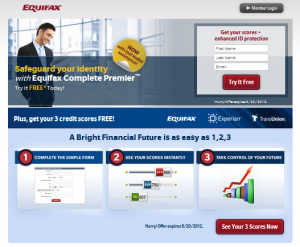 The Equifax free trial page is a good example. Nothing distracts from the information provided – i.e. everything you might want to know if you’re considering using Equifax. Read the offer, click through and order. Lead Generation (Lead Capture) Page – Squeeze pages are by no means simple, even though they don’t have “much” to them when compared to Infomercial type pages. 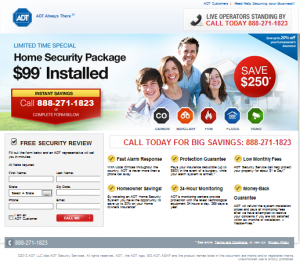 ADT is a good example of a lead gen page, with the exception of the links at the top of the page. A true lead generation page wouldn’t have any links at all, and nothing to do but enter the information. Product Detail Page – Product detail pages (such as this page at ThinkGeek) have a ton of information about a product. There’s only one problem: distractions. It’s easy to get lost and spend two hours surfing without actually buying something. You’re looking at Thumb Drives, come across the DC Comic Thumb Drives, see the Green Lantern Power Ring Kit and the next thing you know you’ve scanned their entire collection of T-shirt phrases. KISS is not in practice for ThinkGeeks landing pages, but you’re sure to come back… usually with money. Where Does a PLP Go? There are also microsites, or small interest sites that branch off the main site. They might have URLs like nicheinterest/mainsite.com. They may also be completely off the main site and only linked to it, as in the case of numerous WordPress.com websites. Finally, and most commonly, there are the landing pages of the website itself. On these friendly, helpful pages, one can find product and service descriptions, buying guides and more. No matter what your marketing campaign is meant to achieve, what product/service you’re offering or what landing page you use, remember to focus. Even if you have a product page on your main site, surrounded by distracting links, the page itself needs to be tightly focused on that one product. (Note: When you’re on the ThinkGeek site, you might get distracted, but it isn’t because the content is about something else. All the written content is most definitely about the product). Focus is the key in any marketing campaign. The fewer the distractions, the better your returns will be.